Honey Bee Facts - Astounding Things You Didn't Know! Astounding Things You Didn't Know! Interesting honey bee facts that will astound you. Domestic hives may have over 80,000 bees. Castes in colony: 3 (queen, workers,& drone). There is only one queen in a hive and her main purpose in life is to make more bees. The queen can lay over 1,500 eggs per day and will live two to eight years. 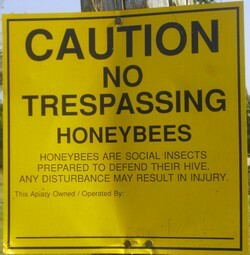 Any Drones (males) left at the end of the season are considered non-essential and will be driven out of the hive to die. All bees work - When young, they are called house bees and work in the hive doing comb construction, brood rearing, tending the queen and drones, cleaning, temperature regulation and defending the hive. Older workers are called field bees. They forage outside the hive to gather nectar, pollen, water and certain sticky plant resins used in hive construction. Workers born early in the season will live about 6 weeks while those born in the fall will live until the following spring. A healthy colony of bees can produce 300 to 500 pounds of honey per year. Bees fly 55,000 miles for 1 lb of honey. A bee visits 50 to 100 flowers during one collection trip. Bees have been producing honey from flowering plants for 10 to 20 million years. The Queen bee’s stinger is curved with no barbs on it and she can use it many times. Drone bees have no stinger. Unlike the stingers in wasps, the Worker bees in the hive have a stinger that is barbed. When the bee pulls away, the barb anchors the stinger in the victim's body. The bee leaves the stinger and venom pouch behind and soon dies. Honeybees communicate with each other by “dancing.” Scout bees dance to alert the other bees to where nectar and pollen are located. The dance explains direction and distance relative to the sun. Bees also communicate with pheromones. A honeybee flies at the speed of 15 mph. Mathematically, honeycomb is the second strongest structure in the world after the pyramids.